TippingPointStocks.com a Long Term growth stock advisory service aiming for 50-200% gains per position! Just launched October 4th 2017! Join now at Charter Member Rates! Have you looked into our TippingPointStocks.com service? For a limited time you can join under the $500 discounted Charter Member Rate while still available. A long term growth stock service aiming for 50-200% gains on each position with an active long term portfolio. We aim for 15 stocks eventually and currently have 4. Read up and consider joining! Our most recent position is up over 20% in two weeks and would have paid for your membership with a small position size, we think it can triple from current levels in 12-13 months. A new position is due out this week. 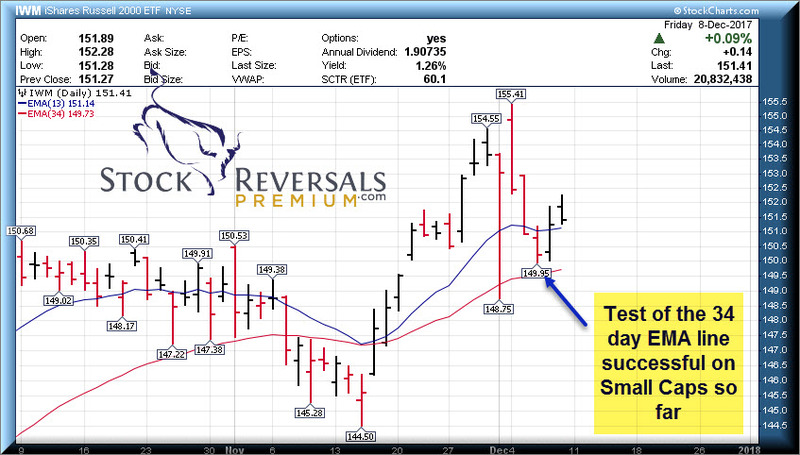 If not yet a Free Member of Stockreversals.com , opt in here with name and email to get timely reports. 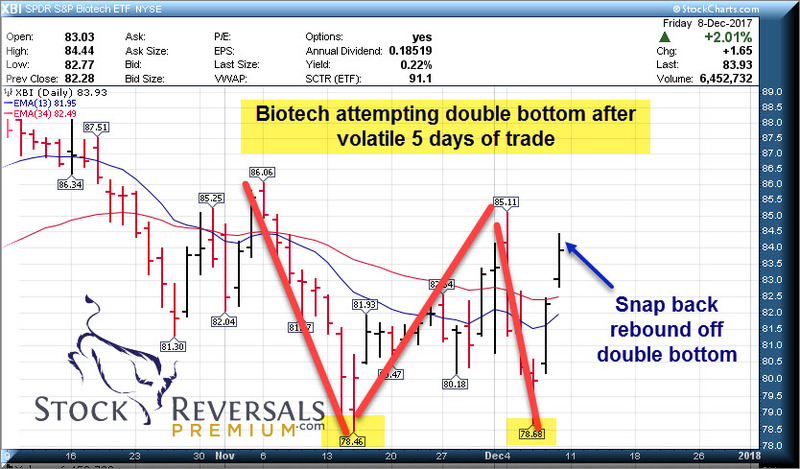 The markets have been volatile as we projected around that 2660 pivot area as well as that December 3rd turn window. However, the good news so far is support pivots have been tested by the SP 500, Small Caps and other indexes and held so far. 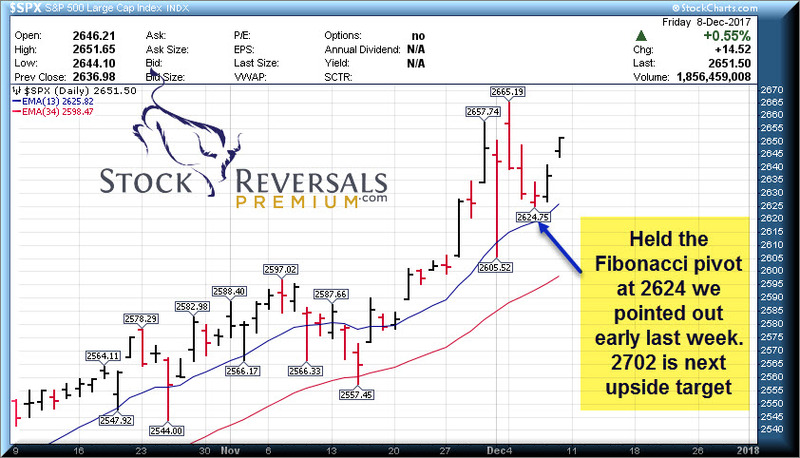 We bounced off a 2624 Fibonacci Pivot we laid out for SRP members early last week as key to watch, with 2599 the lower end. We could see a rally into end of year to 2700 area especially if we get further clarification on tax reform. The retail stocks are leading indicators of consumer strength and we see the financials along with Steel, Cement and other industrial growth areas leading. In summary the markets are consolidating and remain healthy. We had a strong pullback in Chinese names the past few weeks which was overdue, many of which rebounded later in the week. We were watching Alibaba to see if that 159 area would hold and put in a bottom. The stock bottomed at 164 this past week then rebounded along with other names like YY etc. Bulls still at 64% in Advisory Surveys vs only 15% Bears, this is at a decade type high and a contrarian topping signal. A smaller list this week as many stocks are either extended or bouncing off bottoms but not yet confirming uptrends. OSTK- Has corrected from 65 to 42 area in last two weeks, now may be ready for another run up. 77% Historical Success Rate on Trades!